POSTED January 17, 2018 12:09 p.m.
MOUNT VERNON, Iowa — UW–Platteville rang in 2018 with a bang, winning two weight classes and placing second out of 17 teams at the Cornell Matman Invitational in Mount Vernon, Iowa. Augsburg, the top-ranked NCAA III team in the country, according to InterMat/NWCA, won the team title with 133, while the Pioneers were runners-up with 106.5. 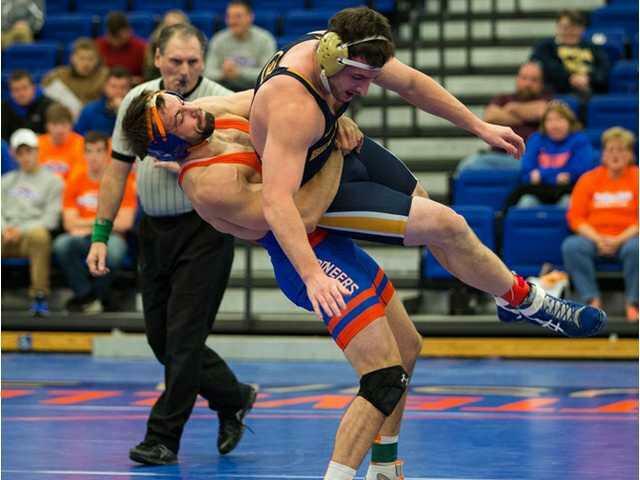 Junior Grant Wedepohl, ranked second nationally at 184 pounds, took down the top-ranked wrestler, Augustana’s Christos Giatras, 8–1 in the championship match. Wedepohl won three earlier matches to set up the #1 versus #2 title bout. Junior Jon Goetz, ranked third at 174, won all five of his matches to win his weight class. He downed Augsburg’s Tanner Vassar, ranked sixth, 9–2 in the finals showdown. Goetz pinned two of his early-round opponents and won another by a major decision. At 285,junior D’Andre Johnson advanced to the championship match before losing to Cornell’s Tyler Ortmann via a medical forfeit. Johnson topped teammate Lucius Rinehart 10-0 in the semifinals. Placing third was Isaac Brosinski at 165, while Rinehart was fourth at 285, and Chase Katzenmeyer was seventh at 133. Coach Mike DeRoehn’s team returns to action Friday at Augustana and then again Jan. 23 at UW–La Crosse in a match postponed Thursday because of unsafe roads. Team scores — 1.Augsburg 133, 2.UW–Platteville 106.5, 3.Stevens Institute of Technology 98, 4.Cornell 85.5, 5.Concordia–Moorhead 84.5, 6.Wartburg 68, 7.UW–La Crosse 65.5, 8.Loras 63, 9.GrandView 59.5, 10.Luther 55, 11.Augustana 39.5, 12.Iowa State Wrestling Club 38.5, 13.Coe 37.5, 14.Dubuque 37.5, 15.Simpson 31, 16.Buena Vista 25, 17.Lakeland 4. 165 — Isaac Brosinski’s place is 3rd and has scored 17.00 team points. 174 — Jon Goetz’s place is 1st and has scored 25.00 team points. 184 — Grant Wedepohl’s place is 1st and has scored 23.50 team points. 285 — D`Andre Johnson’s place is 2nd and has scored 19.00 team points. 285 — Lucius Rinehart’s place is 4th and has scored 13.50 team points.